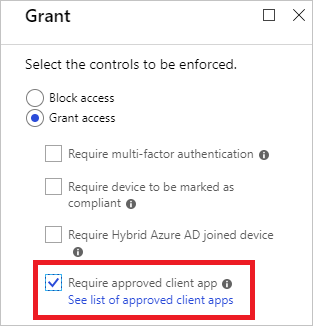 You can use Azure Active Directory (Azure AD) conditional access to control how authorized users can access your resources. If this is not the information you are looking for, please leave a comment at the end of this article. With conditional access policies, you control how your users access your cloud apps. When you configure a conditional access policy, you need to select at least one cloud app. 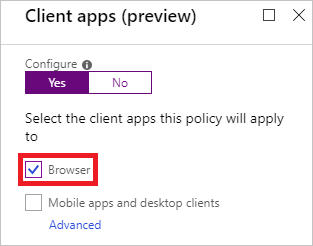 In your conditional access policy, you can select Browsers as client app. 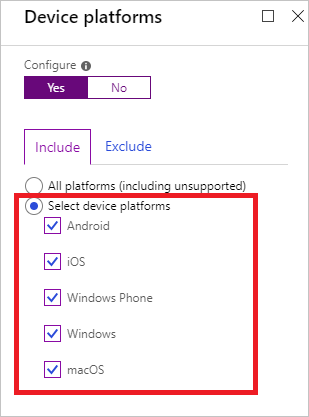 On Windows 7, iOS, Android, and macOS Azure AD identifies the device using a client certificate that is provisioned when the device is registered with Azure AD. When a user first signs in through the browser the user is prompted to select the certificate. The user must select this certificate before using the browser. For Chrome support in Windows 10 Creators Update (version 1703) or later, install this extension. These browsers support device authentication, allowing the device to be identified and validated against a policy. The device check fails if the browser is running in private mode. 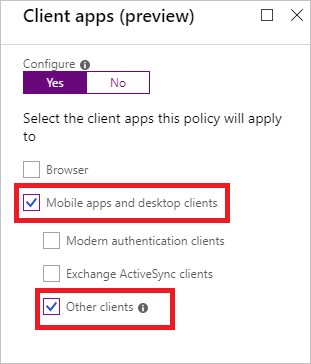 In your conditional access policy, you can select Mobile apps and desktop clients as client app. By selecting Other clients, you can specify a condition that affects apps that use basic authentication with mail protocols like IMAP, MAPI, POP, SMTP, and older Office apps that don't use modern authentication. For more information, see Client apps. 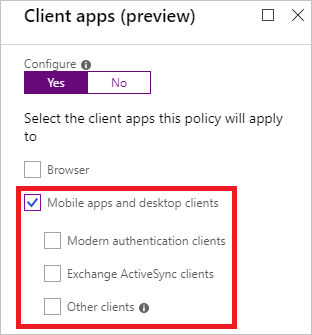 In your conditional access policy, you can require that an access attempt to the selected cloud apps needs to be made from an approved client app. The approved client apps support the Intune mobile application management feature. Only supports the iOS and Android for device platform condition. 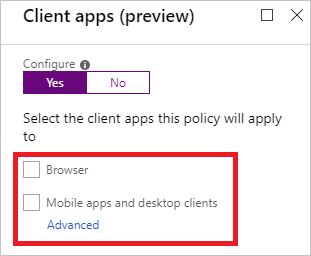 In your conditional access policy, you can require an app protection policy be present on the client app before access is available to the selected cloud apps. Apps for app protection policy support the Intune mobile application management feature with policy protection. For an overview of conditional access, see What is conditional access in Azure Active Directory? 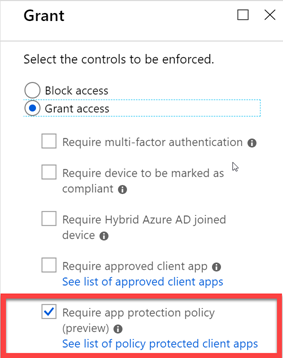 If you are ready to configure conditional access policies in your environment, see the recommended practices for conditional access in Azure Active Directory.